After arriving in the Maroon Bells Wilderness Area near Aspen, Colorado, and shooting well before sunrise, I made my way to Crater Lake and back. On the my return to Maroon Lake, the winds stopped, puffy white clouds drifted across the Maroon Bells peaks, and the reflections of mountains, blue sky, and white clouds were some of the best I’d ever seen. I spent some time photographing this amazing scene for a time - until the winds kicked up again. The thing that really noticed was that no one else was around. All was quiet, still, and beautiful on this summer morning in the Elk Mountains. 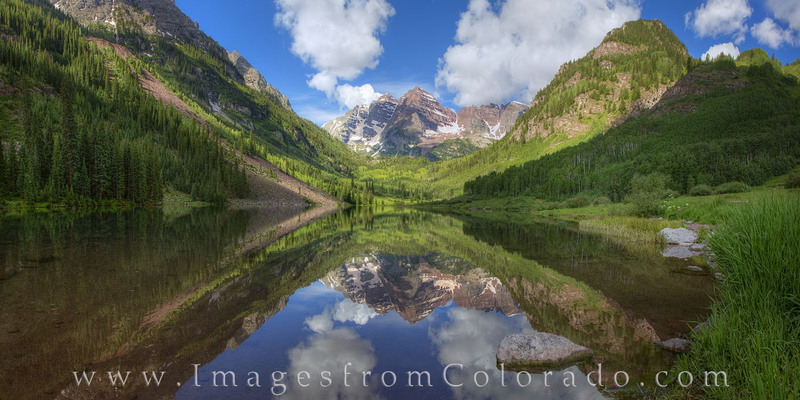 This Maroon Bells panorama is available in larger and custom sizes.